Trip log, day three. Cozumel. …I hope to join Emily in the gym… The going to bed at my east coast time did wonders, I was up and ready to join Emily at the gym. Only problem was that everyone else had the same idea. Now, I am not what you would call a regular at the onboard gyms, but today was absolutely the most packed I’ve ever seen the gym. This is not an exageration, every elliptical, bike, treadmill, stair stepper, and 90% of the strength training machines were in use at any given time with others waiting their respective turns. And, we got there at 6:05am; the gym opened at 6am. As for the Disney Cruise Line gyms, my favorite are on the Magic & Wonder, as are Emily’s. All the machines face forward overlooking the bow, whereas on the Dream & Fantasy, you are looking starboard. As crazy as it seems, it feels odd running as you are moving in a different direction. However, Em definitely prefers running on Deck 4 on the Dream & Fantasy. The Juice Bar that was added during the last dry dock is reminiscent of the counterpart on the Dream. Emily and I met up with Isabelle for breakfast in Cabanas. 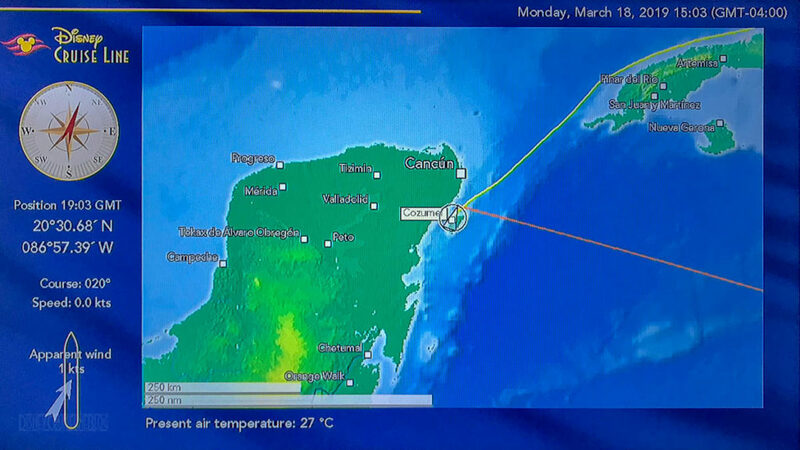 It was the perfect time to sit and watch our arrival into Cozumel, Mexico. On the agenda today is well, not a whole lot. 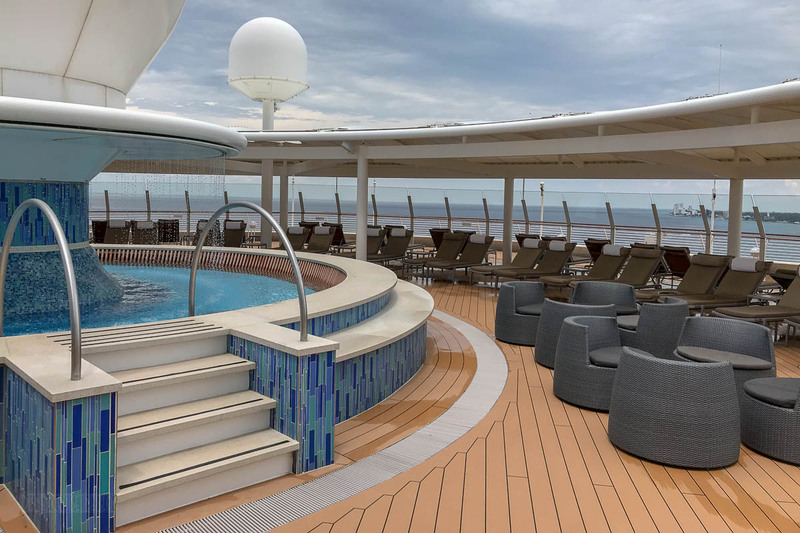 We are treating today as a sea day to take advantage of the pool deck while most are ashore. The last time were were in Cozumel (which was last March in 2018), we did the Fury Catamaran port adventure that takes you snorkeling and to their private beach with water toys. 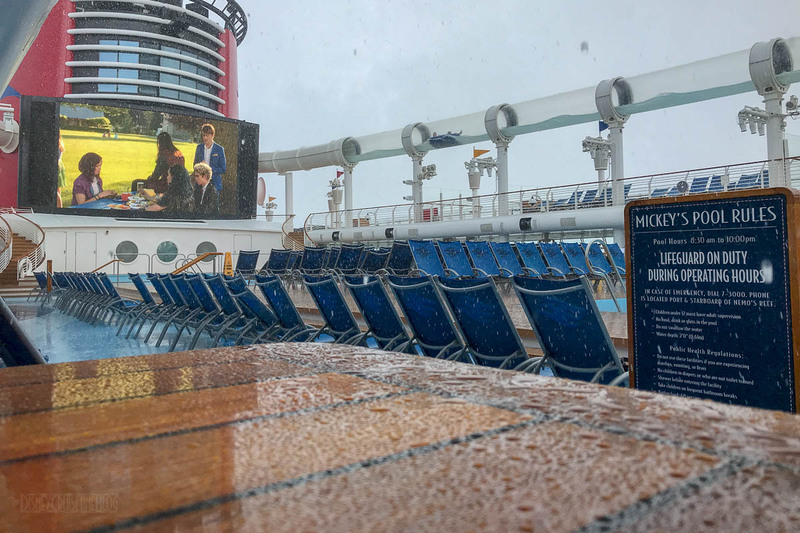 Looking at our plans for the next two ports, today seemed like a great day to skip an excursion and instead watch movies poolside. Plus, we’ve been to Cozumel quite a few times. The first movie up on Funnel Vision was a family favorite, Ratatouille! Isabelle enjoyed the pools, AquaLab & Mickey slide, while Em read her book & watched the movie. I did some work at a nearby table & then joined them shortly after. The Descendants was the next movie up on Funnel Vision and then just before noon, it started to pour. 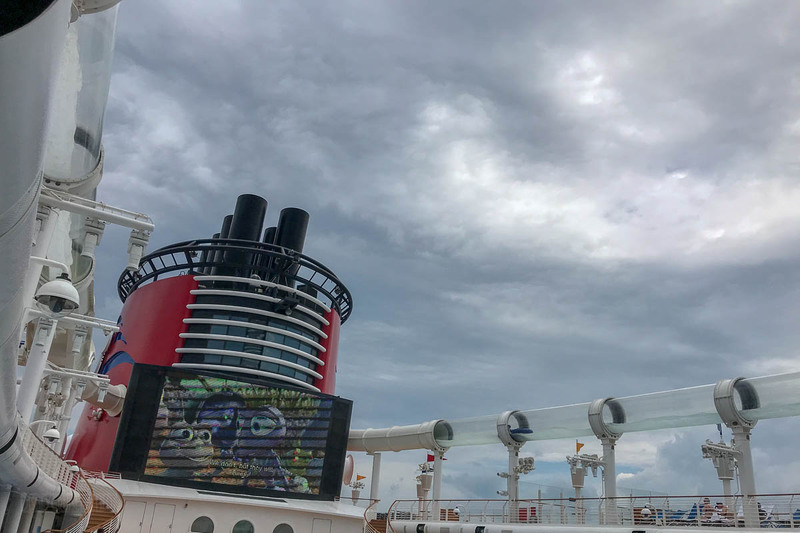 Thankfully, it was just a passing shower and not a thunderstorm since the later would have closed the pools and AquaDuck. The rain moved on and we returned to our chairs where we ate our lunch. Today, we had some items from a variety of locations, Cabanas had a nacho bar and Flo’s offered the usual quick service options. Isabelle and I took advantage of the cleared pool deck by getting in a short line for the AquaDuck. By short, I mean the line started just inside the funnel which resulted in roughly a 10 minute wait. Isabelle is just a hair under the 54” height requirement to ride by herself. I have a feeling the next time we sail on a Dream class ship she will be able to ride by herself. Isabelle headed to EDGE to play Scattergories, but they didn’t end up playing the game and the following group activity, shuffle board on deck 4 got delayed. Emily and I went up to Satellite Falls, and while there were only 4 people in total in the area, the water was chilly, so we decided to take the time to enjoy the hot tub in the Quiet Cove since they are no longer hot tubs in the near the Donald pool. We had a decent window of time in the afternoon before our next planned activity, so I put in a load of laundry and we watched the rest of Black Panther. I love the new laundry setup where you buy virtual tokens which can be shared with everyone in the stateroom. The best part is that when the machines are finishing you will get an alert on your wave phone and if you are lucky enough, an alert via the Navigator App. Still, I find the best solution, the one that never fails me, is to set a timer on my watch. Interestingly enough, the dryers were not showing how much time was remaining. With the laundry folded, ironed, and returned to the room, we set off for more trivia. The laundry ended up taking a bit longer than I expected which resulted in missing the start of Movie Tunes trivia. We arrived at the end and based on the last few songs, I think we had a fighting chance at winning. The club host for this cruise is Chris, and he has been great. Isabelle and I put forth a valiant effort in TV Tunes trivia. We started off strong, but as the trivia progressed, we had a number of empty lines on our papers. The worst part of all tunes based trivia is when you recognize the tune, but you cannot name it. 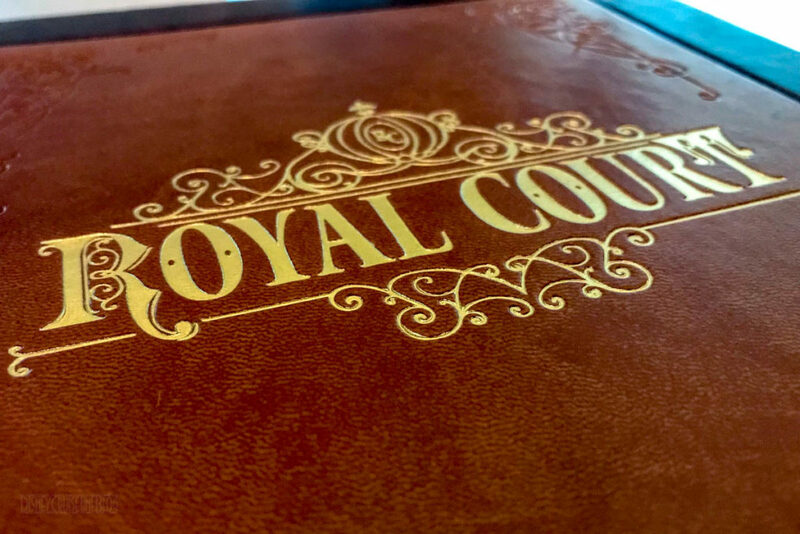 Our dinner tonight was in Royal Court. Our serving team of Mario from Indonesia and Cindy from the Dominican Republic continue to provide excellent service. I’m seriously not just saying this because I’ve been brainwashed by the team to remember those end of cruise surveys. To their credit, they haven’t given us the typical stump speech on ‘excellent service’ with a mention of the survey. Our head server is Kaydrian from Jamaica and he too has been great. We look forward to coming to dinner each night. 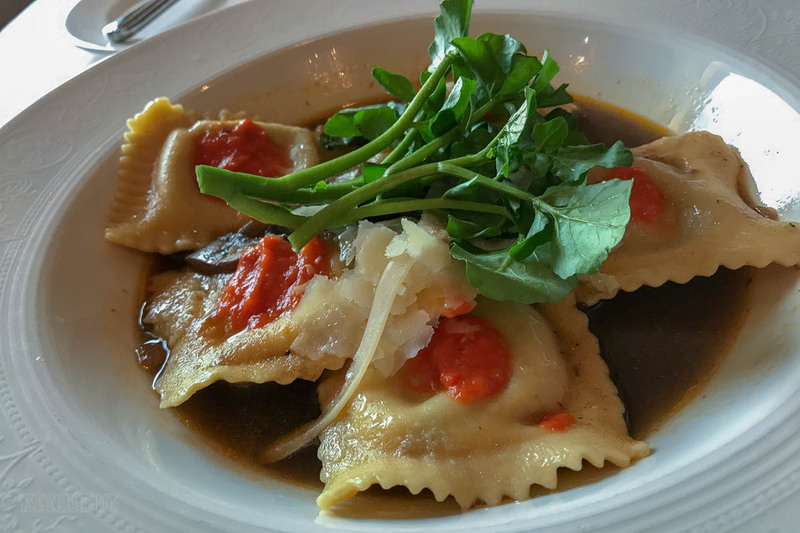 When Mario took our order tonight and Isabelle ordered the Conchiglie Pasta, he immediately asked Isabelle for a Plan B. 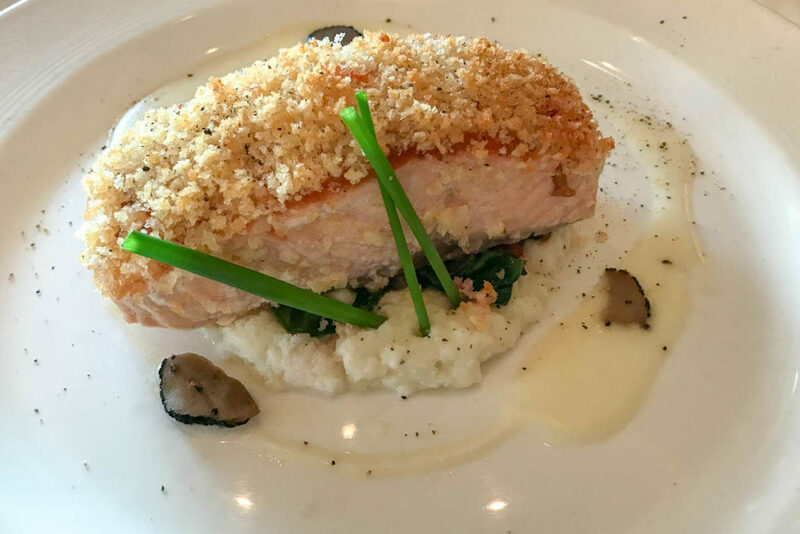 He told Isabelle the dish looks good on paper, but it would be in her best interest to order a backup. 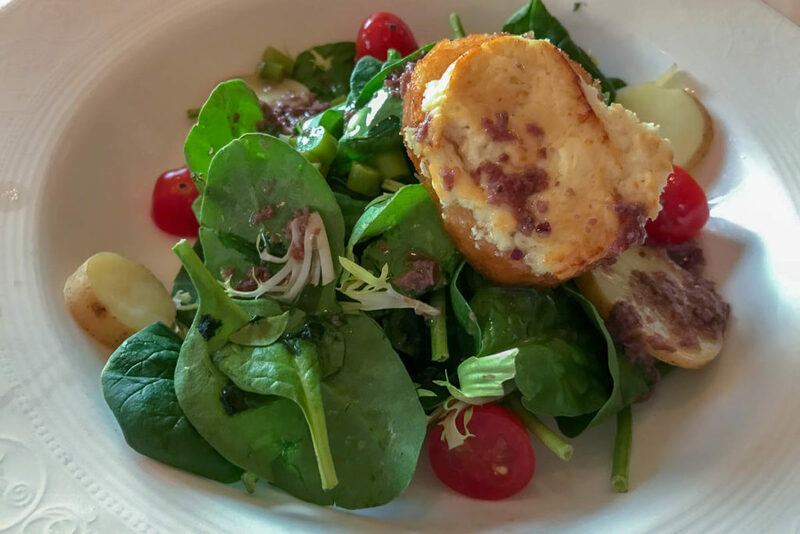 We’ve had a few servers over the years who do a great job at stealing us away from dishes that are not coming out of the kitchen as they should. I went an entire 7-night cruise on the Fantasy once where I just let our server pick my entree each night and it never disappointed. Moral to this rambling story is that the good serving teams are beyond excellent and it is a good idea to listen to their suggestions. Coupled with our serving team being so awesome, as well as skipping a course each night, we are getting out of the main dining rooms quickly giving us time to go shopping without the pre-/post-show evening crowds. For some reason we keep leaving the shops with something. 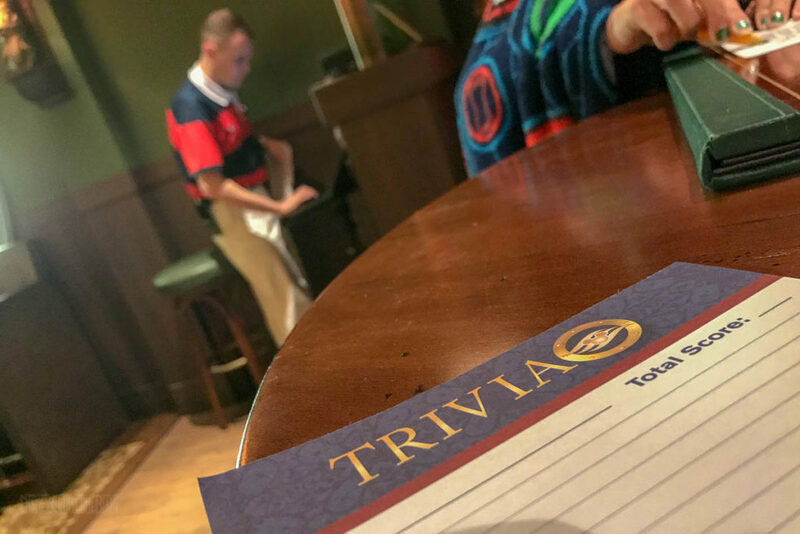 We headed back to O’Gills for 90s tunes trivia and it was a packed house; standing room only! This time, we faired much better, but still did not come close to winning. Overall, we had a blast! 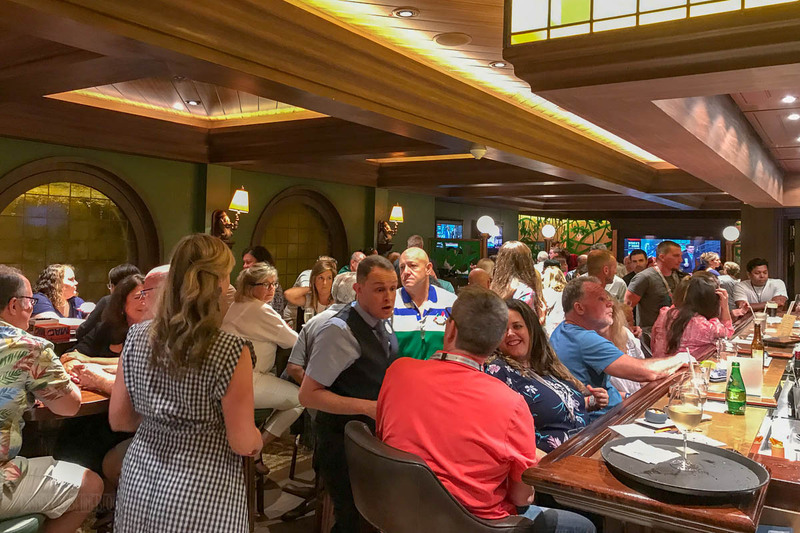 The trivia has been very popular and O’Gills has been packed each time. 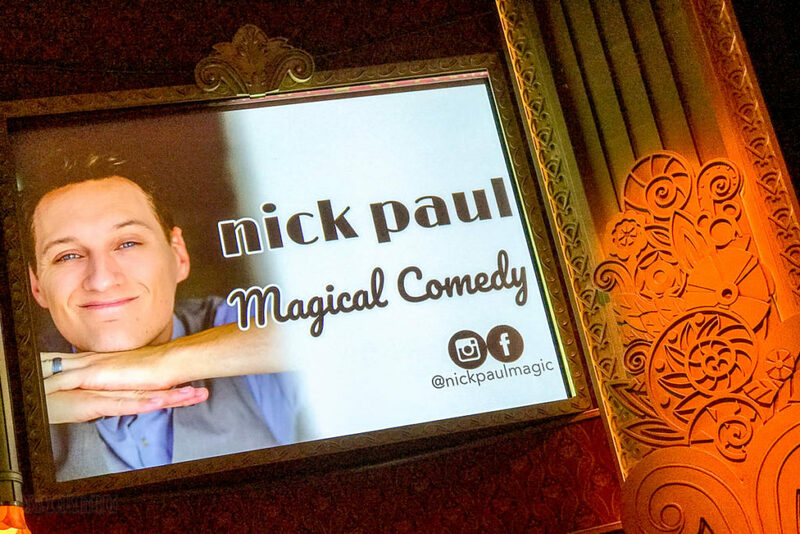 Tonight’s entertainment in the Walt Disney Theatre is the Magic & Comedy of Nick Paul. Nick was a consultant on the Netflix show Magic for Humans and can often be found doing magic on the Boardwalk at Walt Disney World. After the show, it was back to the room to rest up for our day tomorrow in Grand Cayman, our first day going ashore this cruise. 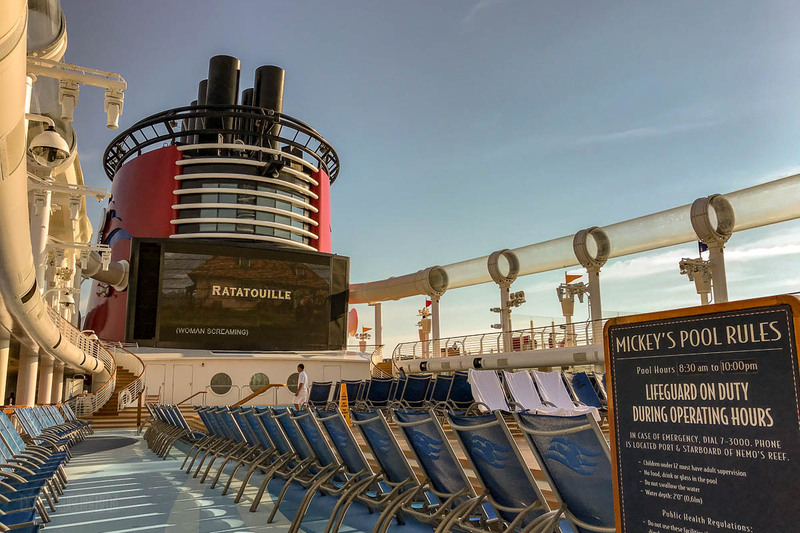 This entry was posted in Trip Report and tagged Cozumel, Disney Fantasy by Scott Sanders. Bookmark the permalink. Wow! I just read that you have Mario as your server! We had him on our second cruise in August of 2017. He was amazing! Really great service! When it comes to the trivia in O’Gills (winner of both 80’s tunes trivia on the Fantasy last August here! ), I wish they would move them to late nights – after the performance in the lounge ends. There’s generally nothing else to do at that point. So either moving the trivia, or even starting the last movie in BV theatre a little later so people can get to it after the lounge act would be ideal. There is a drastic falloff of events in the evenings while during the afternoon and early evening there are overlapping events. Curious if the Navigator showed up in your room after your request. Yes, and after speaking with others they are getting them in the room after they too requested them to be delivered. What happened with your Personal Navigator? Did you get one during turn down? Did you have to wait in line at guest services? Yes, you need to wait in line at Guest Services as they are not out to grab. You can also ask your stateroom host and they will deliver one each night. My sister was recently on the Wonder during Spring Break and she said they didn’t get a navagator in their room until they asked their room host to provide one nightly. She had to have the paper version because her older smart phone would not load the app. Disney must realize at not all people run out and buy the lastest in phone tech when an old phone is still working. She had no problem getting one but had to jump thru the hoop without prior knowledge before boarding. She wanted a second copy for mom and said she didn’t have to stand in line at guest services because they had the regular box of navagators sitting on the counter for easy access. 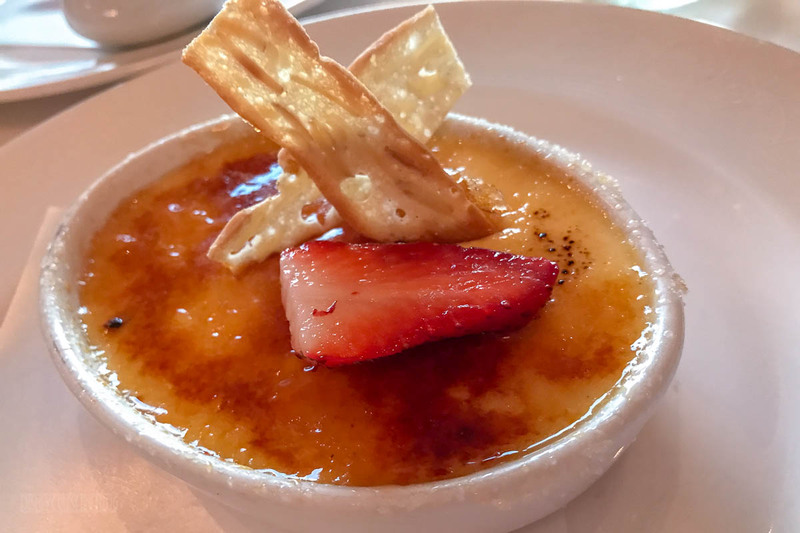 My son was steered away from the same dish over a year ago- why is it still on the menu? also same experience here with the Conchiglie Pasta on the Wonder a couple years ago. 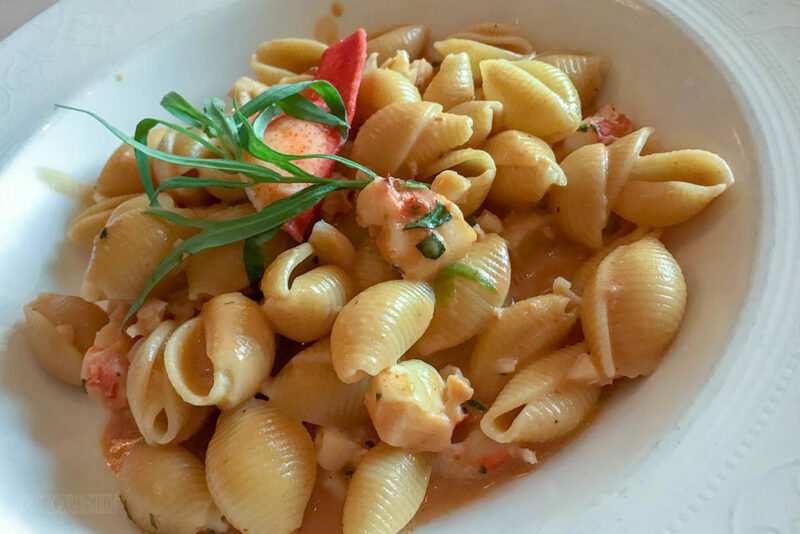 I was basically told not to order it because the flavor is very strong, and its one I knew I wouldn’t like, but, it’s lobster and pasta…what can go wrong. So I tried it and it *was* terrible haha! I agree that the paper Navigator should continue to be delivered nightly to your cabin. 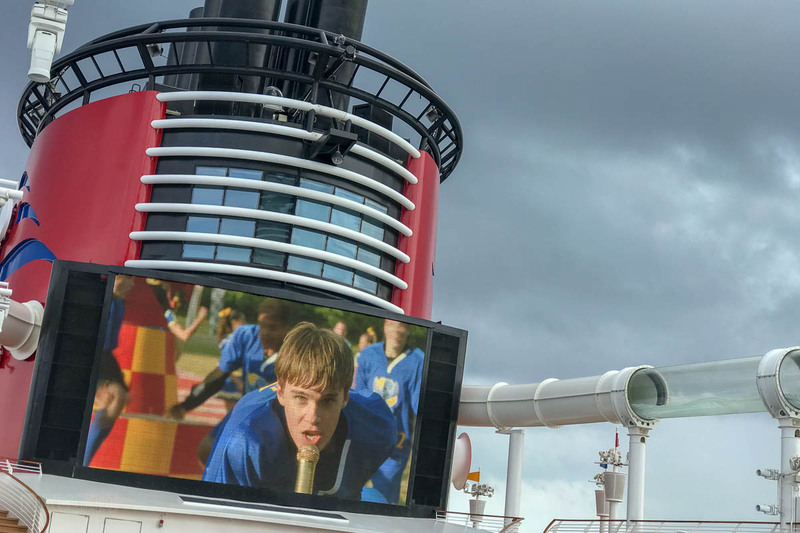 I do not want to carry my cell while on a cruise. On previous cruises we have noted the large amount of largely unwanted paper advertisements that are delivered. These include the multiple Disney Vacation Club flyers, Port Shops Informaton sheets, and future cruise flyers. How about cutting that clutter? I started taking notes during the cruise for a post focused on the current paper navigator situation and the unwanted junk is my first bullet point.